SEO link building is an important component of an internet marketing campaign. The more good quality links directed to your site, the better it will perform. When it comes to link building, the focus must be on the quality of the backlinks. Links from dubious spam-like websites will have no benefit and can even be detrimental. Here at SEO Service Pros, our team doesn’t use mass linking software or any type of link farming activity. 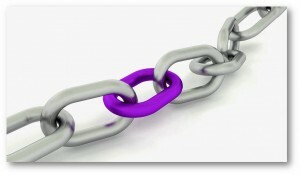 Only good quality links from sites relevant to your business are considered. And all links are created manually to ensure quality and acceptance. When we implement a link building campaign for your website, you’re assured of one-way links from websites with a minimum PageRank 2. There is no need for reciprocal links and our full link validation reporting keeps you informed about your campaign. If you’re considering a link building campaign and need some advice, why not give us a call? The number is 0845 601 2237. Alternatively, you can send us a message with your link building enquiries. Backlinks help your website’s optimisation. A backlink is a one-way hyperlink which allows website visitors and the search engine robots to travel from one website to another. All SEO backlinks must be relevant, as well as coming from reputable websites. The relevance might refer to your industry sector or geographic location. For example, a London restaurant would benefit from a link from a UK good food guide because it is relevant to both the market and location. If you’re struggling to understand the significance of link building, think of your website as a house in a remote part of the country. The backlinks are the road network. If you want people to come and visit your house, they need roads to get there. The more roads leading to your house, the easier it is for people to visit you. The same applies to your website. And backlinks, like roads, have different degrees of importance (e.g. motorways, ‘A roads’ and ‘B roads’). So if you have a link from a very important website like the BBC, it would have a higher value than a backlink from a small site with less standing. So, an SEO link building campaign will provide greater access to your website, increase traffic and improve your search engine optimisation. SEO link building should be an ongoing activity to maintain a good level of optimisation. If you don’t have the time or the skills to implement a website linking strategy, send us your enquiry or call us on 0845 601 2237. We’ll not only set you up with quality backlinks, we’ll also monitor the progress and development of your SEO, to make sure you’re getting value for money.